Thank you to everyone who danced and filmed the WHD Dance! I am so thrilled to see your interpretations of the choreography. So many different flavours and styles; they are all terrific. Check out the growing playlist on YouTube. Please send the video, unedited and at full resolution, via YouSendIt, RapidShare or a similar service. We will accept videos through 11/25. The e-mail address to use is spinmatsuri@gmail.com; please include your hoop troupe name and location for the video credits. If you post your video on YouTube, please name or tag your video with ” WHD Dance 2011″. Don’t forget to include your hoop troupe name and location for the video credits. And drop a PM to mediatinker or mail spinmatsuri@gmail.com to make sure it’s added to the playlist and the compilation. We will accept videos through 11/25. 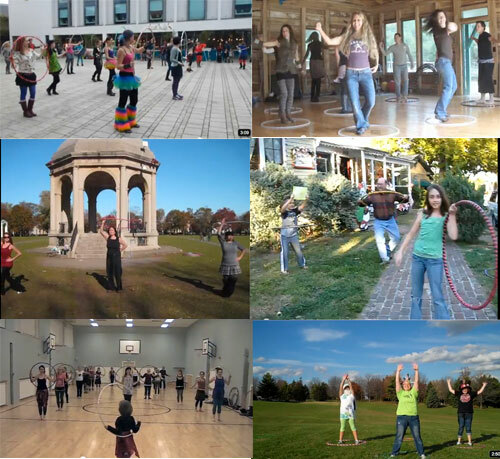 World Hoop Day, coming up on 11/11/2011, is a celebration of hula hooping and a charity fundraiser with events planned world wide. One part of the WHD activities is the World Hoop Day Dance, and this is WHD Dance HQ. Get some hoop friends together to learn the dance. It will take a couple of hours to learn and extra practice will make it extra good. Perform it on or around 11/11 as part of your World Hoop Day event. Film it, then send the video in to Spin Matsuri to be included in the WHD Dance compilation video. First, watch the video to see how it looks. The choruses are exactly the same and the verses share similar moves, so you will have them memorised in no time at all. The solo sections allow time for four soloists to show their moves or freestyle play for everyone. Here are the choreography notes, a “teacher’s guide” with lyrics, counts and details perfect for anyone who is learning or teaching the dance. And for rehearsals, there’s a downloadable version of the video. Also, I made an audio file, WHDance2011-Counts.mp3 (5.4MB), that features me counting out the moves over the music. This will save you having to shout it all out yourself and your whole troupe can practice with it on their own to ensure that you’re perfectly in sync…5,6,7,8… We also have The Safety Dance MP3 (2.6 MB) without the narration. This year’s WHD Dance was choreographed by Tomomi Ara and Kristen “Tink in Tokyo” McQuillin on September 4th. The World Hoop Day charity has been run by Hoopin’ Annie since 2006 and we are thrilled to have her support for this related project. The song we’re dancing to this year is “Safety Dance” by Men Without Hats, copyright 1982. If you want to learn more about the song and its crazy video (watch carefully to spot a hooper), read this very detailed article. Mahalo Tink for all your hard work with providing the choreography, notes, etc. Hope to get a big group of HoopSUP’rs with the help of our local SUP shop Covewater and HoopCamp Heather Troy doing a modified version of this on the water (we’ll see…). Maybe WHD Annie will join us also?!?! Awesome! Next week is the first class for my kids’ After School Program. I’m going to *try* to incorporate your choreography into the class so that I can send you a video. The girls are young, though, but I’ll do my best!!! Thanks for the choreography, notes and mp3 files, Tink! November 11 is on a Friday this year, so I’ll probably go solo on this at the local park after I get off work at noon. Tink, is there any possibility that we could get the video in a podcast? I’d love to be able to put it on my iPod so I can watch while I rehearse. Thanks! Oops – found the link after I posted that; please disregard. Have a blessed and hoopy day!